I am a certified Master REIKI Healer. I offer One-on-One Healing as well as “ distant healing”. Using my knowledge and I my healing powers, I can help those who are in-need. I will work on your energy to create a beneficial effect on your physical, emotional and spiritual self. REIKI is an energy healing developed in 1922 by Japanese Buddhist Mikao Usui. During treatment, you will feel like a wonderful glowing radiance that flows through and around you. Reiki treats the whole person including body, emotions, mind and spirit creating many beneficial effects that include relaxation and feelings of peace, security and wellbeing. Many have reported miraculous results. A fee will be charged towards this service. If you are interested, and you feel you need to be treated with REIKI, I am here for you. This service will be offered as a One-on- One if you are within Montreal Island, or as a distant healing where ever you are on the globe. Even if you live in another continent, I will be able to heal. Time of healing: Person needs to be in total relaxation mode, either laying down or sitting. My email is rawloverecipes(at)gmail.com to set up the time and day for the treatment. Give me the difference between the various levels of reiki. Level 1 is a practitioner's initiation into Reiki and is open to anyone. The focus during Level 1 is on opening the energy channels on a physical level, allowing the practitioner to connect to the universal life force energy, which flows from the cosmos through the crown of the head and down to the heart and hands. Many Reiki Masters emphasize self-Reiki as the goal of the Level 1 designation, encouraging students to focus on practicing Reiki on themselves, thereby working through their own obstacles. The Reiki Level 1 attunement was initially given in four separate attunements. There are some Reiki Masters who still teach using this method. However, many Reiki Masters provide the Level 1 attunement in one single attunement. Many experience physical symptoms of energy in their palms after the first attunement — including tingling, coolness or heat. Typically the Level 1 course also includes an overview of the history of Reiki, hand placements and self and group practice. The Reiki Master Level is traditionally considered the teacher's level — a practitioner who has received the energy and knowledge to attune new Reiki practitioners. Many receive the Master attunement, along with the corresponding symbol, yet don't feel comfortable or practiced in properly attuning others — hence the distinction between Third Degree and Reiki Master. 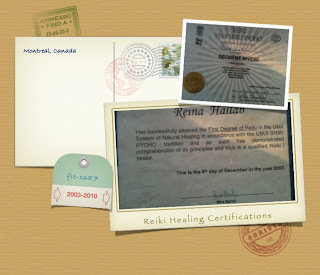 The Reiki Levels provide a general organization of the progression of Reiki mastership. Because Reiki courses are taught and organized in a wide variety of methods, it's important to research and find both the format and instructor that is right for you.